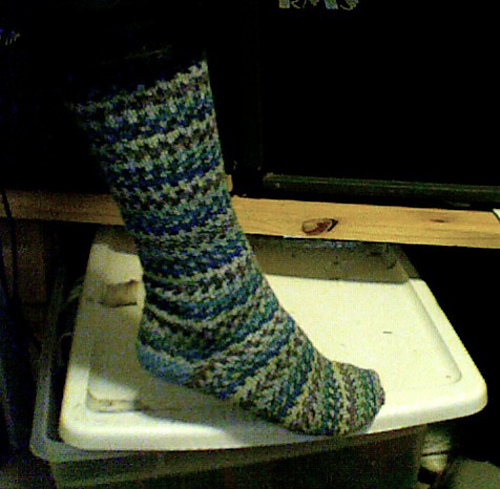 Latte: Ben is working on some vanilla socks and a rediscovered sweater. Abby has spent most of her week in the frog pond, ripping out the Maia Shoulderette, but has had a fair bit of success with the Greenfield Cardigan. Grande: Ben finished his Kindle case with an unusual closure. Abby has completed her Vine Yoke Cardigan. Demi Tasse: A quick roundup of new knitting magazines. Interweave Knits has a great new article by techknitter. Brewing: Abby is contemplating colorwork and shoulder shaping. Bite: Do you ever dream about knitting? Do you know how to pronounce Eunny Jang's name? Chai: Abby's secret crush revealed! Abby talks about seeing him on Broadway. Our mini-contest winner was Ms. Kalendar of Brass Needles. Also, Patrick Stewart with hair! Caffeinated: Pie is the new cupcake. Bittersweet Chocolate Cherry Nut Pie and Apple Green-Chili Pie With Cheddar Crust and Walnut Streusel. Latte: Ben is working on some vanilla socks and a kindle case. Abby is almost done with her Vine Yoke Cardigan. Stir: Ben met up with Rachel (Roue) of the KnitCents podcast to learn to spin. Bite: A quick reminder to prove that you were once a child. Don't be scared! Chai: Abby went to see Pee Wee Herman live on Broadway with Dalya. Mini-contest: Try to guess Abby's secret crush! Brewing: Ben wants to modify God Save The Queen from Pretty in Punk for maximum ridiculousness, using Ella Rae Classic Superwash and Noro Taiyo. Abby has experienced a flurry of inspiration from reading The Knitter's Guide to Hand-Dyed and Variegated Yarn. Tip Jar: Ben goes over the basics of the afterthought heel. Abby talks about learning to read your knitting. 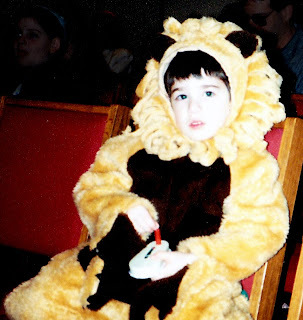 Ben in a lion costume that Abby made. He was around three years old. Chai: Abby dropped in on the Men's Knitting Group at Knitty City. They have recently been profiled in the Wall Street Journal! Tip Jar: Ben shared some unexpected uses for Judy's Magic Cast On. Taste: We talked about some of our favorite TV shows. Abby is almost through all of Deep Space 9, while Ben is working his way through The Next Generation. New shows that they both like are: Boardwalk Empire, Terriers and Dexter. Both are looking forward to the new show The Walking Dead, about zombies, of course! 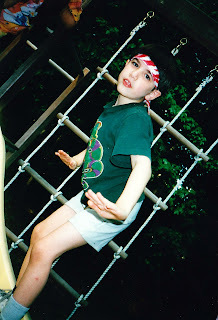 Come join our ravelry group and spread your own embarrassment by posting a picture of yourself as a child! We did. 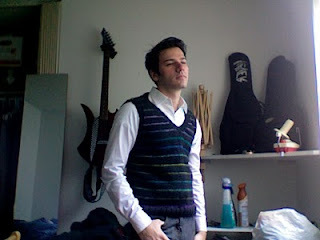 Grande: Ben finished this vest of his own design. He's writing up the pattern to share. Latte: Abby continues to work on her CeCe sweater, frog mittens, Tree of Life socks, and she started the Girl's Best Friend socks out of Trekking Hand Art. Ben is furiously trying to finish his Mojo socks. Brewing: Ben's thinking up a new strawberry hat. Abby bought yarn for the Vine Yoke Cardigan. She noticed that the new yarn, Tosh Vintage is called "worsted", while the Free Range she's been knitting with is called DK. The DK, however, looks heavier than the Worsted. What do you think? We talked about hats we like and asked listeners to share their favorite hat patterns on the ravelry group. Some of our favorites are: Cranio, Dead Fish, Jayne and Brain Monster. Taste: Abby reviewed New England Knits, a book of classics with a twist. Tip Jar: Ben shared a technique for jogless joins in the round, and Abby shared some tips from Maggie Righetti's Knitting in Plain English and Sweater Design in Plain English. Finally, Ben claims that he was never a child, but there is evidence to the contrary! Please join our ravelry group here!